At Comet Ping Pong we love to party and we love hosting events. Our private party room is the perfect place to throw a birthday party, a dance party, or just a group get-together! With up to two ping pong tables, a private bar, a dedicated sound system -- it is pure entertainment. It can be configured to comfortably fit 20-50 people and we offer a myriad of exciting activities and extras that no other birthday party will have (think: a ping pong pro demonstration!) 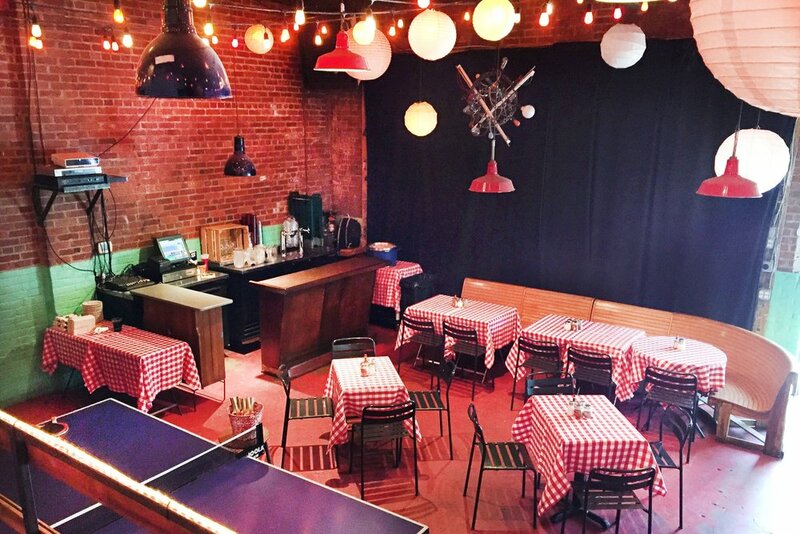 Comet Ping Pong is also available for corporate or social lunch events. You can even rent out the whole restaurant! We are open to all ideas of course. Please fill out the form below and we will get back to you shortly! What space in Comet would you like to reserve? Please note we do not take reservations for the main dining room. The back room holds 20-50 guests, with the option to rent additional space for up to 75 guests. Full restaurant can hold up to 200 guests. What time do you want your party to begin? What are some alternative dates for your party if the space is already booked on your desired date? Tell us more about your party. Approximately how many people? What time would you like the party to start? What is the occasion or theme? Please feel free to leave questions, too!